Caroline Wozniacki allayed any fears over her left knee after she required treatment during her WTA Finals victory over Petra Kvitova. 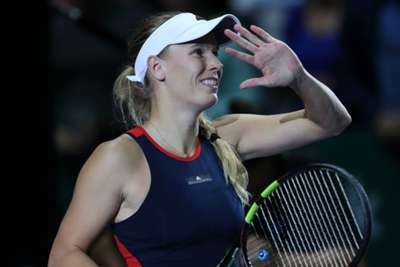 In a crucial White Group contest in Singapore, Wozniacki battled to a 7-5 3-6 6-2 win to boost her last-four chances following an opening defeat to Karolina Pliskova. However, there were major concerns when the defending champion needed a medical timeout midway through the second set, requiring strapping as her movement was hindered. Wozniacki, though, insists the issue is not serious. "My knee is all right. I'm going to get some treatment," she told reporters. "And, thankfully, I get some rest before Thursday [when she plays Elina Svitolina]." On her performance, Wozniacki added: "I'm just pleased how I kept cool out there. "I didn't think I played badly in the second set and I just had to stay focused. "The level was way better than it was on Sunday from both of us. Hopefully I get a good match on Thursday."